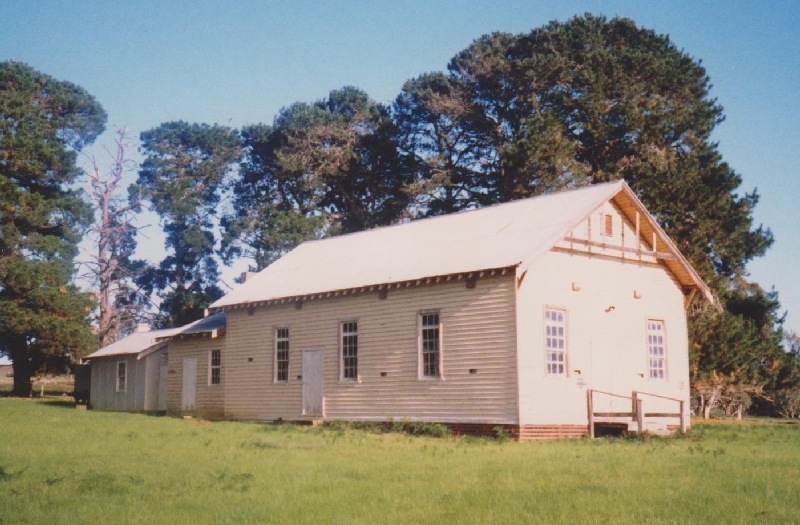 On the 25th of June 1890 HT Charles M. WATERS opened Nangeela SS3037 in a leased building. The a.a. during that year was only 8 pupils (5 boys, 3 girls). HT WATERS remained in charge until 1st of October 1891. The school closed on 21st of January 1893. Due to the settlement of ex-servicemen on part of Nangeela Estate, a second Nangeela School 4474 was opened by HT Pearl L. KEW-MING on 31st August 1950. 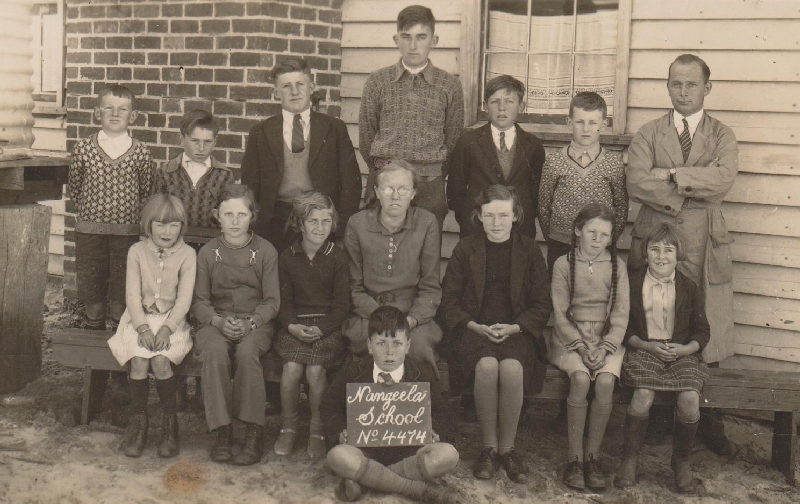 Miss M. Brady, who taught at Nangeela in 1948 remembers the schoolroom at the back of the Nangeela hall with old-style desks and a teacher's high rostrum. About 10 children were enrolled. Teachers boarded at Nangeela Homestead owned by the BLACK family. W.A. COTLER [sic COTTER] on behalf of the settlers asked that a school be established at Nangeela. The residents erected a hall in which SS4474 Nangeela was opened on 19th of October 1930 under Pearl KEW-MING, HT until January 1931. NE was 15. Arrangements were made to convey the children of Nangeela to SS3777 Dunrobin and the school closed on 31st of August 1950. NB: There is conflicting information on dates in the two above paragraphs that come from separate entries in "Vision & Realisation". Nangeela S.S. No. 4474 circa 1938. Lorna Black, Dulcie Davidson, Valmai Nowacki, Joan Mill, Pat McNicol, Betty Mill, Ethel Holmes. Casterton News – April 19th 1928. The tender of Mr. W.J. Peden at 413 pounds has been accepted for the erection of the Nangeela Hall, for which the settlers have been working to raise money since the settlement of the Estate. The Hall measured 50 feet x 25 feet, with 14 ft walls, covered with gable roof. It has a dressed jarrah floor with a 10 feet stage and painted cream and brown. The Nangeela residents held a working bee to erect a fence made of spilt posts. The Hall was opened on the 10th May 1930 with a Sports event, Dance and Cookery competition held during the afternoon followed by a Dance that evening. The Nangeela Hall President, Mr. W. Coxon invited the Shire President, Cr. A. Rees to speak. 28.8.1930 – William Coxon and John Howlett signed a lease agreement of 12 pounds for the Education Dept. to use the hall as a school. The school opened in October 1930 and the classes held in the Supper room. The first teacher was Miss Pearl Kew-Ming from St Arnuad. Some of the original pupils were Edward and Margaret Coxon, Ian McCalman, Leric Nowacki, Clair, Joan and Stan Mill, Irene, Alex and Norma Donne, Ronald and Jack Tait, Kenneth Blyth, Kevin Black and Ellie Koch. Some of the other teachers at the school were Mr E.P. Phelan, Mr J.R. Smith, Mr Creagan, Miss E. Heffernan, Miss M. Brody & Mr Cass. Mr Cass taught at Dunrobin school from 1951-53. One of the former pupils remembers attending Dunrobin Primary school during the Second World War because there were no teachers available to teach at Nangeela. Miss Heffernan from Coleraine, came out of retirement during WW2 to teach at Nangeela. The school closed in 1950 and the Hall was removed in 2007.